I am doing an extra posts, since I have a few things to show you and new things for Friday. I finally finished my lighthouse and not too happy with how it came out. I used a photo that I took of the Point Judith lighthouse, so my first that I did on my own. I used Teresa's technique for a paper background and antiquing, but the paper didn't seem to show through too well and the crackle did not work for some reason. I even got the brand she uses, so not sure what I did wrong. Even if it is not what I was hoping for, I still enjoy practicing and learning and find it relaxing to paint. I also got an idea, I had to try. I get distracted to easily, lol. I wanted to try a photo transfer on canvas. I used a mini canvas and reduced the photo to fit. I used Modge Podge by applying it to the canvas, then you put the photo, picture side down, onto the canvas. Once it sets over night, you use a wet sponge to get the paper off and it leaves an image. As you can see, I didn't transfer a few pieces of the photo by the white spots and in some areas the design started to fade and mix colors in other areas. So, another experiment gone wrong, but It may have been the paper I used or the canvas, so will try again. It is fun to do and easy, so by using junk canvas or cutting out some wood to try, I keep the cost to a minimum. I tried adding a bit of color and then antique medium to cover some of the flaws. We had a slight warm spell on Sunday, so we got out on the beach for an hour. The tide was just going out and with the wind, the waves were coming up to high, so it was hard to find much glass. 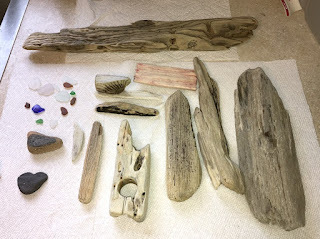 But I did get some nice pieces of driftwood. I put it in soapy water with a little bleach and now they are air drying. They lighten as they dry, but I like the darker sections too, they will be fun to use in projects. I hope you are all enjoying your week and enjoying time to create. I think the lighthouse looks great. Didn't know about transferring a photo to canvas using modge podge. Some day when the rug hook is pried from my paw perhaps I'll give it a try. 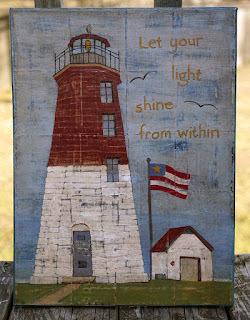 I absolutely love the Point Judith lighthouse...a place I had gone to many times in my youth. I think it is perfect! oh what fun trying new things and they look great.... so many things I didn't realise even existed..
Wow! 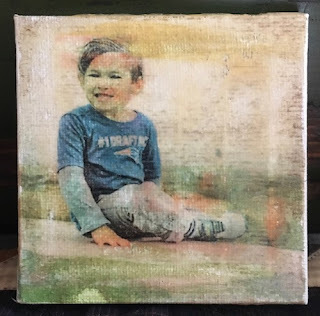 The picture of your grandson was an interesting choice to play with the technique. I like it. Debbie, I really like your photo transfer! I like both of your projects. Trying new things, you never know how they will turn out so it is better just to experiment and learn as you go. I think both turned out fine and quite artistic. When photo transferring the trick is the printer your printing your photo from. I can't remember which it is, but I had the same problem and it turns out I have the wrong printer. I think it's an Inkjet that's needed...or visa versa lol. I wasn't about to go out and get a new printer so I antique waxed my photos and now they look really neat.